Kitchen cabinets are already very expensive and installing bamboo kitchen cabinets in your kitchen will not be a cheap venture. If you have a very tight budget, find out how much they will cost per inch and then go ahead with it. If you have a decent budget for remodeling the kitchen, you should use bamboo, as the cost of designer cabinets from any other wood will be of the same price. Before going ahead with the idea, of having kitchen cabinets made from bamboo; decide whether it will suit your style. Bamboo will give your kitchen a very hip and modern look. It looks great with stainless steel kitchen appliances and gives your kitchen a modern styling. If you prefer rustic homely things, then it is better to stick to wood cabinets. Keep in mind the type of things you have in your kitchen and whether they would look good with a whole range of bamboo cabinets. You wouldn’t want to have a mismatched hash of different types of surfaces in your kitchen space. As you haven’t handled much of bamboo, it is easy to be hoodwinked and cheated when it comes to finding out a good deal. Be very careful when choosing a bamboo cabinet. The cabinets made from bamboo should be very thick layer and not a mere thin one. The veneers made from bamboo may be very thin. If you are choosing plywood made from bamboo, remember that they can be made completely from bamboo. 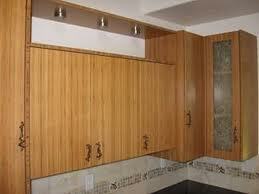 Cabinets made from bamboo, do not always use materials that are 100% green. If you really want to take a step towards a greener kitchen, then you must be careful to9 check the nature of the bamboo used in your cabinet. Some manufacturers tend to use laminated bamboo which uses a chemical processing. Once you know how green your bamboo is, you will also be sure that the amount you pay for it is worth it. Bamboo has a long life span. Once you use bamboo in your kitchen, you can be rest assured that it will last you for a very long time. Be sure to use genuine bamboo, or else the result will not be so. These guidelines will help you choose a greener option for your kitchen remodeling and ensure that you don’t have to spend money on changing anything due to wear and tear for a long time.